Israeli wounded in stabbing attack in Karmei Tzur. Terrorist eliminated. A 34-year-old Israeli security guard was wounded on Wednesday morning in a stabbing attack in the community of Karmei Tzur in Gush Etzion. 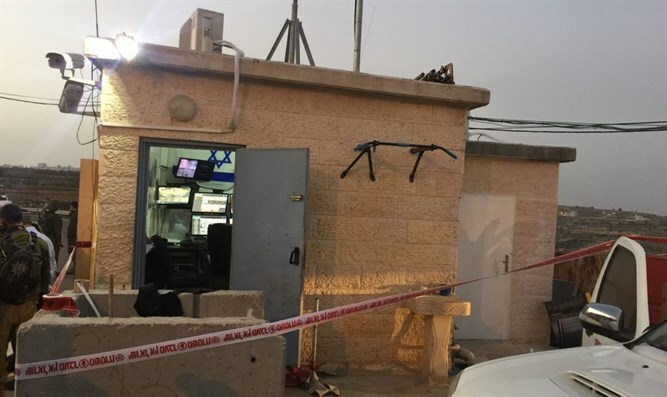 The attack occurred when a terrorist arrived by car at the entrance to the community and stabbed a security guard, who suffered light injuries. A second security guard who was at the scene opened fire at the terrorist and killed him. The victim was evacuated to the Shaare Zedek Hospital in Jerusalem. On Tuesday evening, gunfire was heard near the community of Einav in Samaria. IDF soldiers who searched the area found several shells. There were no injuries or damages. Meanwhile, security forces are continuing to search for Abed al-Karim Adel Assi, the 19-year-old Israeli-Arab terrorist responsible for the murder of Rabbi Itamar Ben Gal on Monday in the city of Ariel. On Tuesday evening, forces from the Samaria Regional Brigade operated in Shechem (Nablus) in order to locate the terrorist. The IDF Spokesperson's Unit said that during the operation in Shechem, some 500 Palestinian Arabs rioted, threw rocks, firebombs and explosive devices, erected barricades and fired live ammunition at the forces. The forces used crowd dispersal measures and fired live ammunition into the air in order to disperse the rioters. During the operation seven suspects were arrested and transferred to security forces for questioning. The IDF said it is investigating Palestinian claims that a person was killed and that several were wounded during the riots.